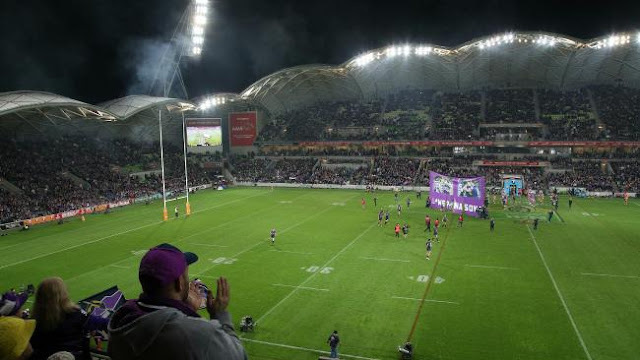 MELBOURNE Storm will have the city to themselves in early March with back-to-back NRL home games at AAMI Park before the start of the AFL season. Storm will open the 2016 season with home match against the Dragons in Round 1 on Monday, March 7. They will be back at AAMI Park to face Gold Coast six days later on Sunday, March 13, just under a fortnight before the AFL season-opener. “It is nice to have a couple of games at home to start the year and we’ll make a real focus on that,” Storm chief executive Dave Donaghy said. Storm’s 2015 draw was marred by a string of dreaded Monday night games and a stack of five-day turnarounds, particularly late in the season. The Monday nights will remain in 2016 with five pencilled in, but there are less five-day turnarounds with two as opposed to five last season. Storm will also host a “home” game in Brisbane against premier North Queensland, replacing the home game it sold to Napier last season. Melbourne hold a strong record at Suncorp Stadium, having won 10 out of 13 matches, including their last five. “It is something we have been discussing with Suncorp Stadium and Tourism Queensland for quite a while now,” Donaghy said. “The opportunity to be part of something that is going to be quite a big spectacle is exciting. AAMI Park will host 11 matches next season, including games against high-drawing clubs such as South Sydney, Sydney Roosters, Canterbury and Brisbane. There is also the welcome return of the New Zealand Warriors for the Anzac Day blockbuster at AAMI Park. Melbourne — who will travel 13 times next season — will play cellar-dwellers Newcastle, Wests Tigers and Gold Coast twice in 2016. But the end of the season will be a challenge with games against Roosters, Cowboys, Rabbitohs, Raiders, Sea Eagles, Broncos and Sharks in the final seven rounds. Although, Storm performed better against the stronger teams last season and struggled against the bottom-eight sides. The bye weekends arrive in Rounds 12 and 18, coinciding with the first and third matches of State of Origin.